Dive right in to explore! The sand dollar is an unusual shell that has long been valued for its distinctive beauty. With its fine details and etchings, this 925 sterling silver sanddollar charm should be the next piece of your sealife charm collection. This is a photograph of the sand dollar charm DC 621 in gold. This is a very detailed three-dimensional 925 sterling silver mermaid charm. Even when you turn her around to look at her back, scales on her lower body and tail, her elbows and flowing hair are distinctly crafted. Add this 925 sterling silver mermaid charm to your sea charm collection for an mythical element! Conches have such beautiful shells. 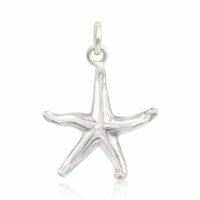 Having one in your sterling silver sea charm collection is a marvellous way to represent the beauty of the sea and sea life. You can't go wrong with this one. 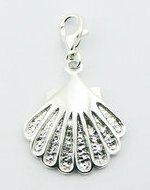 It is three dimensional and lots of effort has gone into little details to render this sterling silver conch shell charm life-like. 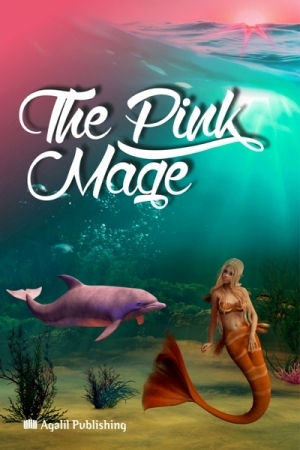 Here's another good candidate for your sealife charm collection. The Nautilus is the only cephalopod with an external shell and what a beautiful shell it is! That beauty is captured in this nautilus charm with Paua shell inlaid. How about one that just focuses on the tail? To provide an embellished option, this whale tail charm is inlaid with 2 pieces of great looking Paua shells. Quality silver whale charms are rather difficult to come by. Not only is this a good piece, the design is unique. This lobster 925 silver sea charm with big, mean, fleshy claws is three-dimensional with very good details even on the underside. 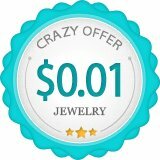 A terrific addition to your sealife charms jewelry collection whether you love diving or seafood. 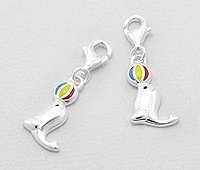 Here's another 3D sterling silver lobster charm with the side view emphasized. You're going to marvel at the level of details. With bits of Paua shells as accents and overall great quality, this lobster will shine in your sea life charm collection. As you can tell, we like them a lot. Especially big and elaborate ones like this. There's a nice contrast between the smooth and etched parts of the scallop with the smooth areas brilliantly shiny. 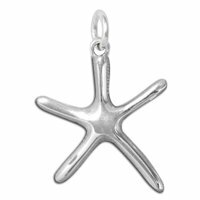 This is good if you are looking for a classic Sea Star charm. 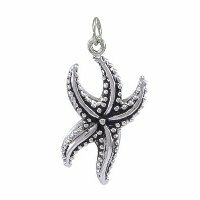 Chances are, this will be the liveliest starfish in your starfish charm collection when you add it in. 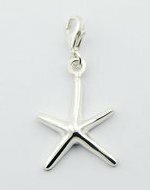 Basic and classic, this silver sea star makes a safe gift. The tips of the arms are curled a little to portray a lively sea star. This little sterling silver 3 dimensional whale has a well polished body. A seal performing a ball balancing act. Adorable as can be. 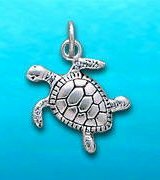 This sterling silver sealife charm is modeled after the Green Sea Turtle. 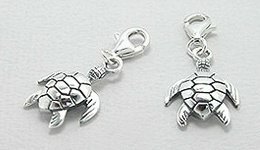 A very cute 925 sterling silver sea turtle charm. How do you know if it is a sea turtle and not a tortoise? Take note of the two front limbs. They are flippers, not webbed feet. A bigger variation of the one above. 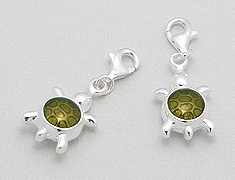 This sterling silver tortoise charm with spiral motif is two sided. Turn it around and you see the same thing but the spiral goes the other direction. We have a baby sea turtle here. The hatchling has an inlaid Paua Shell for his carapace. How fortunate? 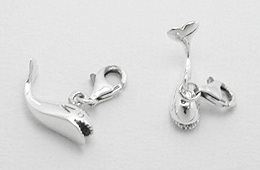 The owner of this beautiful sterling silver sea charm is fortunate too. 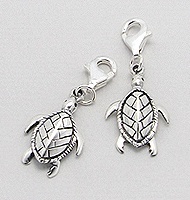 This sterling silver turtle clip charm is three dimensional and well detailed.  You'll appreciate the substantial quantity of silver used and the quality of finish. With a 7mm thickness, this turtle looks chubby and cute. Quality is evident all round including the olive enamel. Another Sea Turtle to consider. What a fine specimen of 925 sterling silver crab charm. All eight legs are detailed and distinct. Those claws look so threatening, you are likely to drop the life-like sterling silver sea charm a couple of times before you are done with it. Those protruding beady eyes add a nice touch.